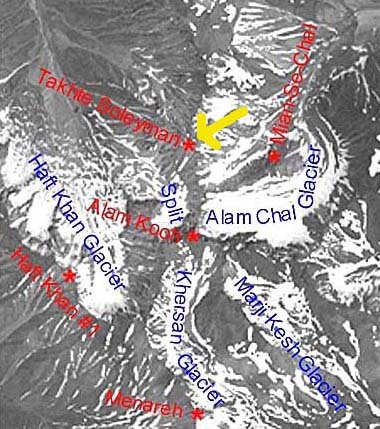 The yellow arrow points to the Takht-e-Soleiman (Soleyman) massif which has 160 distinct peaks above 4,000 meters (above 13,000 feet) in the Elborz mountain range of northern Iran. The B.A.S.E. Noah's ark expedition trekked to a 15,000-foot peak there in July 2005 and June 2006 and found the unusual dark rock outcrop below. 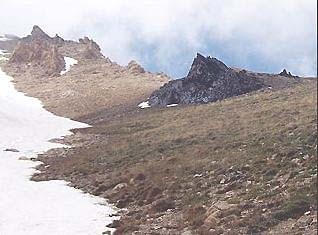 Dark rock in upper right extends about 400 feet through to the other side of the Soleiman peak. Image © 2006 by B.A.S.E. 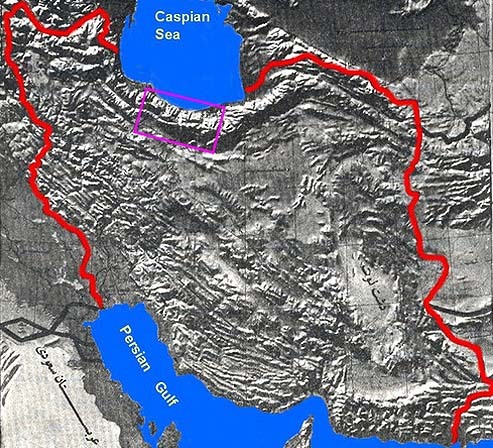 The orchid-colored rectangle is the Takht-e-Soleiman (Soleyman) massif region of 160 peaks above 4,000 feet in northern Iran. July 7, 2006 Monument, Colorado - Long before the time of Jesus Christ, the Bible says God was angry at sinful humanity and planned to flood the planet above all the mountain tops to get rid of everyone. But God took pity on a man named Noah and his family and decided to save them and many animals. The salvation, according to the Bible, was a boat made of “gopher wood.” As the flood waters receded, Noah’s ark came to rest on “Ararat mountains,” plural. In Jeremiah Chapter 51, verse 27, Ararat is called a kingdom that fights with Babylon – not a volcanic mountain in Turkey. In fact, Mt. Ararat, Turkey, was not given that name until around 1200 A.D. That means historically, there was an ancient Ararat kingdom with many mountains in what most likely would have been Mesopotamia, or today’s Iran and Iraq.